As a Full Grill: Perfect for grilling steak, burgers, boneless pieces of chicken, lean meats, fish or vegetables. Accommodates different cuts of meat with varying thickness. As a Full Griddle: Prepares flawless pancakes, eggs, French toast or seared scallops. Ideal for breakfast, weekend brunch or a family meal. As a Half Grill / Half Griddle: Great for grilling hamburgers on one side and toasting buns on the other. Also is incredibly useful anytime you want to adapt a meal to two different tastes, cooking methods and temperatures at the same time. Jumpstarting your day with a nutritious breakfast has shown to improve mental performance, give you energy and healthy carbohydrates and help reduce mindless snacking. What’s more, where breakfast is prepared and purchased has changed over the years. Instead of traditional breakfast meals, consumers are now having breakfast at all times of the day, reinterpreting breakfast foods in creative ways and cooking at home. *Source: Mintel “Breakfast Entrees and Sandwiches,” US Nov. 2010. Flip the grids to the griddle side and heat on 375°. Add all ingredients to a blender, making sure to pour the buttermilk in first. Blend on high speed for approx. 20-30 seconds or just until all ingredients have combined. Pour batter onto heated griddle, using about ¼ to 1/3 cup per pancake. When bubbles can be seen evenly across the pancake, flip over. Serve with syrup, jam, butter or other desired toppings. Serves: Makes about 24 small/medium pancakes. Even better than eating a great-tasting breakfast is the certainty that cleanup will be a breeze. 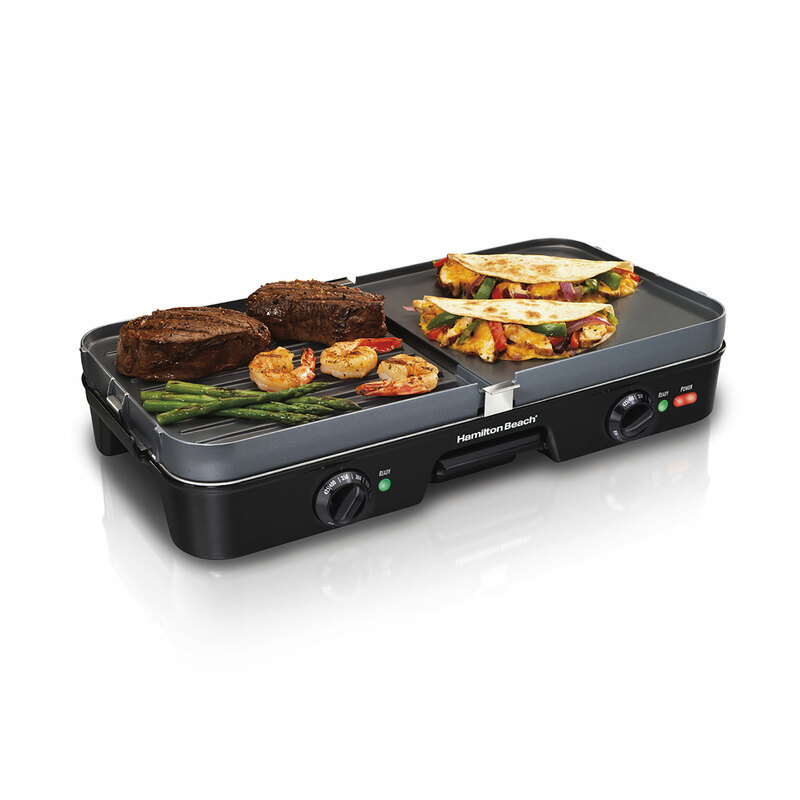 You’re in luck with the Hamilton Beach® 3-In-One Grill/Griddle. After cooking, remove the drip tray from underneath the base and pop it in the top rack of the dishwasher. Snap out the nonstick grids and put them in the dishwasher for easy cleanup, too. To clean the base, simply wipe with a damp, soapy cloth and dry thoroughly. Prepare appetizing meals and reward your palate without the heavy fat, oils and mess associated with frying or the mushiness that’s common with microwaving. Start savoring the idea of easy gourmet cooking with the triple-action versatility of the Hamilton Beach® 3-In-One Grill/Griddle. Enjoy almost unlimited meal choices from one amazingly adaptable appliance. This multifunctional grill/griddle offers three times the grilling options and two times the heating controls as the typical indoor grill. You can use it as a grill, as a griddle or as a grill and a griddle at the same time. Now you can cater to different tastes and cook multiple foods at once thanks to two separate cooking areas, each with its own temperature control. The 3-In-One Grill/Griddle doesn’t cut corners when it comes to your health, either. It’s equipped with nonstick grids that collect and drain excess grease into the center channel to keep the flavor in and the fat out. The end result is the restaurant-quality food every cook wants and the three-in-one cooking functionality every kitchen needs..